Each May 31st, the World Health Organization sponsors World No Tobacco Day. The annual celebration was designed to increase awareness of the epidemic involving tobacco products. The day also brings attention to the need to create policies that help reduce tobacco use. 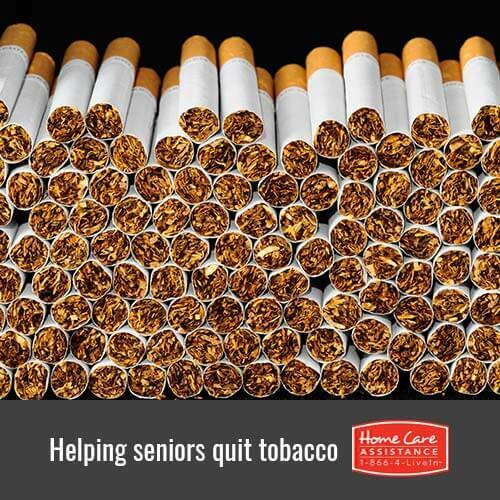 Seniors who smoke know that the habit is unhealthy. Some have quit or tried to quit many times. However, the support provided by loved ones and hourly Rhode Island caregivers can be very beneficial in helping elderly friends or family members quit for good. No one can nag someone into quitting smoking. The smoker must make the decision. Instead, if they voice the need to quit, be supportive. During these times, offer encouragement and support. Resist the urge to become impatient or frustrated if he or she does not decide to quit immediately. Give your loved one space and provide further encouragement when the opportunity arises. Once a senior makes the decision to quit and makes the effort, compliment them and provide positive feedback. You might even develop a rewards system. Establish short and long-term goals. Find healthier distractions for the times when tobacco cravings strike. Have a special snack, play a game, tell jokes or go out for the day. Perhaps your loved one could start a journal to monitor his or her tobacco-free progress. Spend time with your elderly family member to show your support. Physical activities often help distract the mind and body from temptations. Go for a walk. Visit new places. Let your loved one know that he or she can count on you for an encouraging word or a shoulder for support. Demonstrate your care and concern even if he or she becomes irritable. Set quitting milestones for a week, a month or longer and celebrate each occasion. Remember that for the majority of smokers, it may take anywhere from five to ten attempts before successfully quitting. If an elderly smoker falls off the wagon and smokes, do not pass judgment. Let them know that you understand. Offer reassurance and continued support. While it’s important not to pass judgment, your senior loved one’s health is paramount. You can give your loved one the help he or she needs to quit for good when you contact Home Care Assistance of Rhode Island at (401) 284-0979. Our dedicated caregivers are available 24/7 to help seniors meet the challenges of aging and adopt healthy, happy lifestyle choices. Learn more when you schedule a free consultation today.